After fleeing her wartorn homeland, para-athlete Dima Al-Dahouk arrived in Canada in 2017. It was the start of a new chapter both for her family and her athletic career — and now, supporters here are fundraising to help her continue playing. Inside Dima Al-Dahouk's Hamilton home, one massive object nearly fills the living room: a table tennis table. It's a Friday afternoon and the award-winning para-athlete is training with her coach. Clad in a black tracksuit and a tightly wrapped hijab, Al-Dahouk maintains a hawk-like gaze on the whizzing white ball. With one skilful stroke after another, she keeps it flying across the table — back and forth, back and forth, back and forth. "Whether I am upset or happy, I like to play this game," she says later in Arabic. "It releases all sorts of energy." After fleeing her wartorn homeland of Syria, Al-Dahouk arrived in Canada in 2017. It was the start of a new chapter following a life of struggle and perseverance, both for her family and her athletic career — and now, supporters here are fundraising to help her continue playing the sport that's been her passion for more than a decade. The married mother of two has been living with a disability since botched surgery, following a car accident, when she was three years old. While there was little support for disabilities in Syria, Al-Dahouk didn't let that stop her from pursuing sports. First powerlifting, then table tennis in 2006, became her outlets. 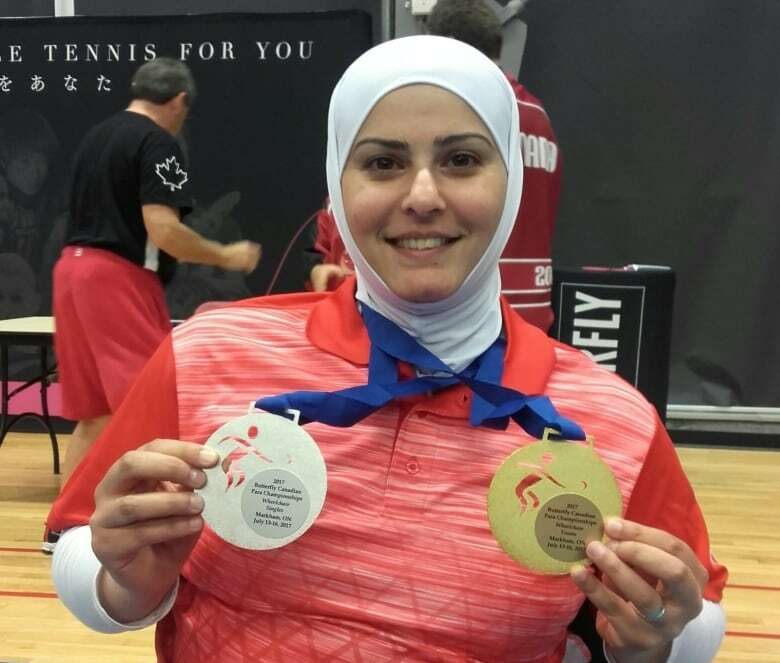 For a decade, she was a champion wheelchair table tennis player in Syria. But when war broke out in 2011, she and her husband — who also uses a wheelchair — fled their home in Harasta, a suburb of Damascus. The pair hurriedly took their two children first to a hotel, then a shelter, then to neighbouring Turkey. Finally last year, they arrived in Canada, which offered the family a "new home and a good life," Al-Dahouk says. Al-Dahouk quickly returned to the sport she loved. In July 2017, she competed in her first Canadian tournament, the Butterfly Canadian Championships, winning a gold in the doubles and a silver in singles. Now, Al-Dahouk and her supporters in Canada want to take things a step further. At a recent newcomer event in Hamilton, Al-Dahouk met a table tennis coach visiting from China. Since then, Li Ying has been helping her new protégé hone her skills — a feat accomplished even though Ying speaks Mandarin, and Al-Dahouk mostly Arabic. "I was touched by her spirit," Ying says, through a translator. The Syrian Canadian Foundation is also fundraising $10,000 to help sponsor Al-Dahouk at local and international tournaments, starting with the September 2018 Canadian Para Championships in Markham. "From the minute I met her I knew she's an incredible human being," says Bayan Kahtib, the foundation's executive director, adding the group eventually hopes Al-Dahouk can participate in the Paralympics. As she continues her table tennis career, Al-Dahouk also hopes to give back — one serve at a time. "I need to help people who have a disability play table tennis, and play sports, and change their lives," she says.